Reiki is a unique type of healing that is drawn by the receiver and not sent. The healer acts as a conductor for the Reiki to travel through. It is given through the hands by placing them on (or just above) the body. The healer’s hands can become warm during a treatment, and the recipient may feel warmth and it is usually deeply relaxing and soothing. A treatment couch is ideal, like a beauticians or one you would see in a holistic health clinic. I use a treatment couch when I give treatments but treatments can be given in a seated position also, or in a hospital bed, on a table with lots of blankets for comfort etc. It is given when the recipient is able to relax and take time out, and when their attention is not required (e.g. never whilst driving or operating machinery). Reiki heals on many levels, and can speed recovery and healing after operations and alleviate pain. In 1999 I had a major accident whereby my two femurs were severely fractured and my patellas broken. I required major surgery and was in a wheelchair; but only briefly, and was walking again unaided and back to work (training to be a nurse) within six months. At this time I was trained in Reiki Level One and Two (since 1998), and used my healing ability for pain relief and to assist the major bone re-knitting that took place. Today I seldom suffer aches and pains related to my accident, much to the surprise of the surgical team. I use Reiki for stress relief, headaches, healing situations and relationships, on my children, absent healings for others, pain, PMS, injuries, and to aid digestion. You are only really limited by your imagination. It works differently for each individual, and for those who feel they may need a lot of treatments, it would be advisable to become attuned to Reiki so they can treat themselves whenever they want. It works on the physical, mental and spiritual body (e.g. energy centres/ the ‘aura’/ chakras etc). If you are trained in Reiki you are not restricted to treating people; you can treat pets, plants and even inanimate objects. Practitioners ‘Reiki’ any medication they need to take and even their home and vehicle! Usually a Reiki treatment is given with the client lying down on a massage couch or suchlike and the Reiki practitioner placing their hands on or above certain areas on the body. The client may be asked to remove jewellery as metal dissipates energy, but clothing remains in place except shoes or tight belts or anything that would interfere with the client’s complete comfort. It is often a deeply relaxing experience; a real treat. Some clients fall asleep whilst others just enjoy a deep relaxation. I like to play relaxing music if the recipient is happy with this. My treatments last for about an hour. After I have finished giving Reiki I give my client a glass of water and let them take their time getting up. Reiki can be received as a one off treatment or for increased effectiveness I recommend treatments in ‘packages’ of between four and six. Does Reiki have any side effects? occasionally feel tired or more emotional for a day or two as the energy in their body realigns and toxins are released. This is perfectly normal and just means the Reiki is doing its job. If you have Diabetes Mellitus you should check your blood sugar levels after the treatment, before administering insulin, because Reiki may reduce the need for so much insulin. If you have an auto-immune disease and you are on medication that suppresses the immune system, because Reiki acts to strengthen the immune system. It may not be advised to be treated if you are a transplant patient if you have to take anti-rejection medication (these are drugs work to suppress the immune system). Reiki is perfectly suitable, highly beneficial and safe for pregnant women and their babies who also benefit from the treatment. Contrary to some beliefs, there is no evidence to suggest that Reiki alters the rhythm of a pacemaker, but if in doubt, check with your GP. A Reiki practitioner has been trained and attuned by a Reiki Master. You cannot learn to give Reiki from a book or distant learning course. There are many books and websites that publish the sacred symbols (used by Reiki Practitioners at Level Two and above) but nobody can use any symbol that they have not been attuned to use by a Reiki Master. I have not published any of the sacred symbols on this site for that very reason.. they are sacred! At level Two a person may give Reiki professionally. Reiki practitioners treat themselves regularly both for healing themselves and their lives but also to keep the flow of energy strong. the more a person uses Reiki (for self or others) the more effective the energy becomes for them. 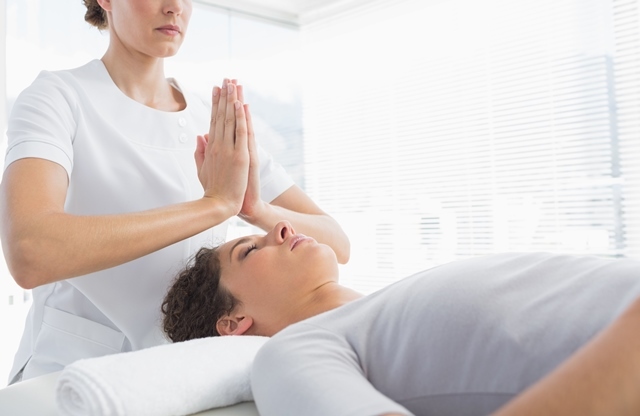 Reiki can be given as absent healings (by Reiki Two practitioners and above) and the recipient is given a treatment even though they are not physically in the same place. Distance is no object! Reiki seeks to heal imbalance of the Chakras, as well as physical and emotional imbalance we feel consciously. Yoga also helps to open up the Chakras and align them. For various reasons our Chakras can be closed, imbalanced, misaligned, ‘dirty’ or even spinning the wrong way. The traditional Reiki hand positions focus on the seven major Chakras, and help to correct imperfections. physical pleasures (including food and drink). overpowered by another; wanting to control another/ others. Heart = Love (romantic, familial, platonic, divine, spiritual). Forgiveness or inability to forgive. Attachments (including unhealthy such as infatuation; co-dependence; unhealthful relationship addictions). Grief. Throat = Communication. Speaking our truth or swallowing it (including swallowing angry words or not standing up for ourselves). Creativity expression. Third Eye = Spiritual and psychic ability (we are all inherently ‘psychic’ but learn as we grow up to mistrust our insights and often ‘shut down’ our abilities due to skepticism and cultural beliefs). become blocked if we feel anger/confusion towards God or Source. When our Chakras are perfectly balanced we feel great mentally and physically. Often a blocked Chakra can manifest in physical and emotional upset. For your ultimate well-being learn to look after your Chakras. You can do this by receiving Reiki treatments, becoming attuned to Reiki, by doing First Degree Reiki or above and treating yourself regularly; through EFT, yoga or by Chakra balancing meditations/visualisations. Gift vouchers are available for therapies, please inquire at susan@lightlifelearning.com or phone Susan on 086-3381850.